This place in France is all about nature activities for the visitors. They can swim, camp, canoe and horse ride. Its natural beauty claims to give it the name as ‘green lung’ of Avignon. It’s a 5 minute walk, crossing the river shuttle, away from the historic centre and amidst the countryside. The view from here is simply breathtaking. Restaurants, camping, sailing club, paintball fields and Farmer's Market add a spark to the visit making it a great hangout. Great walking area and ideal for activities like biking. Ideal for a picnic or a day-out. The last ferry back to Avignon leaves at 07.00 pm in the evening. How popular is Ile De La Barthelasse? People normally club together Pope's Palace and Abbey Of Montmajour while planning their visit to Ile De La Barthelasse. 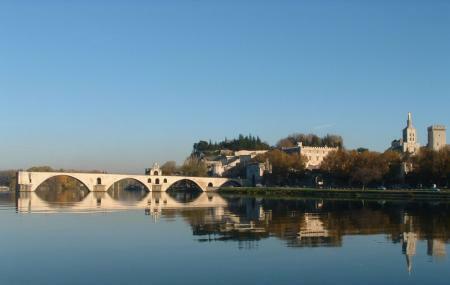 When you are in Avignon, you must walk or hike over to Île de Barthelasse. There is a free ferry to take you across practically the whole day. Ferry has a seasonal schedule that you can pick up at the Tourism office. Ein sehr entspanntes Fleckchen zum verbleiben ... Entspannung pur ... Großzügige Stellplätze im Schatten. Die Sanitärhäuser waren sauber. Es war Abends ruhig und der Pool war wie im Internet zu sehen absolut top! Der kleine Shop bietet alles was man so zum grillen braucht! Vom frischen Obst/Gemüse über Fleisch bis hin zum eiskalten Bier! Die Fähre über den Strom hält genau hinter dem Platz. Fuß und Tennisplatz sind übrigens völlig in Ordnung! Sehr nette Leute am Empfang. Kurz um - wir kommen wieder!